The Nashville Tennessee Temple is the 84th operating temple of The Church of Jesus Christ of Latter-day Saints. After five and a half years the Nashville Tennessee Temple is finally completed and members are grateful. The original site for the temple was changed because after three years of trying to gain approval, a court of law decided not to approve zoning and the Mormon Church did not appeal the decision. 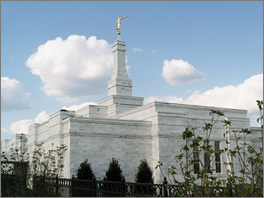 The temple's exterior is constructed from Imperial Danby White Marble and has a single spire topped with the familiar statue of the angel Moroni. It will serve 13,000 members in the Tennessee area. The Nashville Tennessee Temple has a total of 10,700 square feet, two ordinance rooms, and two sealing rooms. About a month previous to the dedication of the temple in Nashville, another Mormon temple had been dedicated in Memphis. This page was last edited on 8 December 2010, at 19:39.